N2AFRICA is a large scale, science-based “research-in-development” project focused on putting nitrogen fixation to work for smallholder farmers growing legume crops in Africa. Legumes bring atmospheric nitrogen into the crops and the soil through a symbiosis with Rhizobium bacteria, and they are an important source of protein in a healthy diet. Enhanced productivity of legumes thereby contributes to improvements in soil fertility, household nutrition and income. N2Africa enables African smallholder farmers to reap these benefits through the implementation of effective production technologies including inoculants and fertilizers. N2Africa links scientific research with capacity building (from farmers to traders, development workers in extension and NGOs), educating MSc and PhD candidates, women’s empowerment, and access to input-output markets through Public-Private Partnerships. A strong network ensures continuous and independent improvement of technologies and market access. 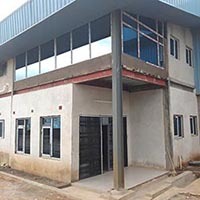 With funding from the Bill & Melinda Gates Foundation, N2Africa has been active since 2013 in Ethiopia, Tanzania and Uganda, and since 2009 in DRCongo, Ghana, Kenya, Malawi, Mozambique, Nigeria, Rwanda and Zimbabwe. Focal legume crops are common bean, chickpea, cowpea, faba bean, groundnut and soyabean. The performance of a grain legume and the associated amount of nitrogen fixed depend on the interaction between the genotype of the legume, the genotype of the rhizobia, the environment and the management of the crop and field: (GL× GR) × E × M in short. N2Africa selects and tests good-potential legume genotypes, does research to identify the best matching rhizobia strains and tries to optimize the management of legume fields. Testing of legume technologies by large numbers of farmers allows for tailoring and adapting legume technologies to specific sites and specific farmers. This results in a set of best-fit principles and options for each project area. 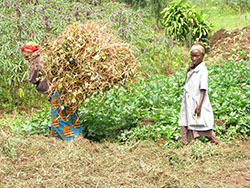 Direct beneficiaries of N2Africa are the farming households with increased benefits from biological nitrogen fixation – such as greater food and nutrition security or increased incomes – and the households benefitting from the network that was built to improve access to information, agricultural inputs and markets. By 2017, N2Africa had already reached more than 600,000 smallholder farmers with improved technologies for grain legume production. Other beneficiaries are producers of legume seeds, legume-specific fertilizer mixes and inoculants through an increased demand for their product, as well as agro-dealers trading these products. Development project staff and scientists are exposed to new ways of doing science through the ‘development-to-research’ framework, and hands-on capacity building activities. By working through national systems, training key stakeholders from farmers to traders, development workers in extension and NGOs, and by educating MSc and PhD candidates in each country, we build the capacity that can in the future sustain an independent and continuous improvement of legume production technologies. 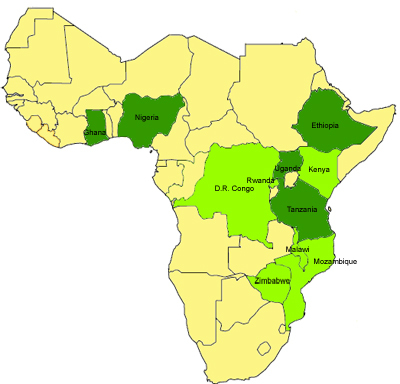 N2Africa Map Overview : Core countries (dark green), Tier 1 countries (light green). Click here to download the N2Africa Final Report of the First Phase. Congress of the African Association of Biological Nitrogen Fixation (AABNF2018), April 22nd-24th 2018, New Beach Hotel, Oran, Algeria. 13th European Nitrogen Fixation Conference (ENFC), which will be held 18-21 August 2018 in Stockholm, Sweden at the München Bryggeriet. WARNING: A Fake International Conference on Nitrogen Fixation, ICNF London. The Minister of Food and Agriculture of Ghana has requested N2Africa and Yara to boost soyabean production in northern Ghana as part of the “Planting for Food and Jobs” initiative. Here we report on progress. 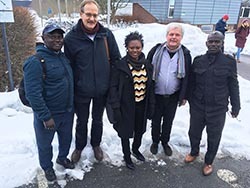 On 5 November 2018, an N2Africa team comprising of Ken, Bernard, Theresa and Samuel and a team from Yara, comprising of Derick Tuffour, Danquah Addo-Yobo and Øystein Botillen, met at the IITA office in Accra, Ghana to discuss the possibility of forming a partnership around soyabean to continue with N2Africa project with possible funding from Norwegian government. 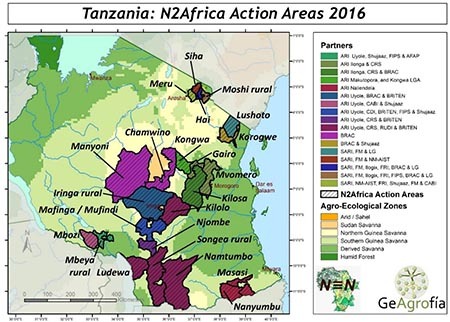 In Tanzania, N2Africa and a number of related projects jointly developed and applied a range of innovative communication approaches to scale-up improved legume technologies. 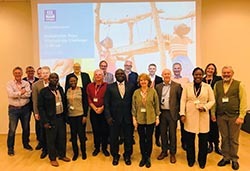 To assess the effectiveness of these communications approaches, N2Africa, the Centre for Agriculture and Bioscience International (CABI), Farm Radio International (FRI) and other partners designed a survey tool using Computer Aided Telephone Interviews (CATI). To what extent is there still a (knowledge) network around legumes and nitrogen fixation active in your country? To what extent are private sector and/or NGOs still selling/using/promoting “N2Africa technologies”? Can farmers readily access seeds, inoculants, legume-specific fertilizers? Are there any interesting new developments taking place around legumes and nitrogen fixation? Update on the legacy in Kenya based on the three questions mentioned above asked to all Tier 1 country coordinators and a testimony of Visionary Farmers Association. Update on the legacy in Malawi based on the three questions mentioned above asked to all Tier 1 country coordinators. Update on the legacy in Mozambique based on the three questions mentioned above asked to all Tier 1 country coordinators. Update on the legacy in Rwanda based on the three questions mentioned above asked to all Tier 1 country coordinators. Update on the legacy in Zimbabwe based on the three questions mentioned above asked to all Tier 1 country coordinators. Despite decades of intensive research on Rhizobium-legume symbioses, we are still only beginning to understand the factors that influence the survival, persistence, efficiency and competition of rhizobial strains in various environmental conditions. 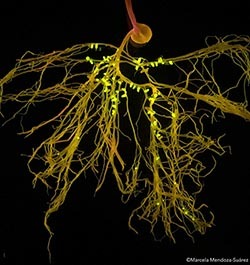 Research focused on the identification of both competitive and highly effective nitrogen-fixing strains has been limited because, so far, the only way to test competitive rhizobial strains has been to isolate individual strains and compare them one at a time in large-scale plant growth assays. 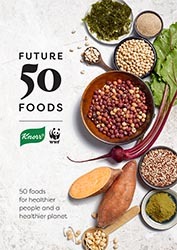 Among other duties, Ken Giller serves as a member of the Sustainable Sourcing Advisory Board of Unilever and through this he was asked to review this report. He was delighted to do so, as he finds it an important initiative to broaden the range of crops commonly used in foods. Of course he was not surprised to see that several legumes were selected by the Knorr team and the scientists who advised them. The final report can be downloaded here and the section on Beans and Pulses starts on page 11. Current and potential role of grain legumes on protein and micronutrient adequacy of the diet of rural Ghanaian infants and young children: Using linear programming by De Jager, I., Borgonjen-Van Den Berg, K.J., Giller, K.E., Brouwer, I.D. Response of common bean (Phaseolus vulgaris L.) to nitrogen, phosphorus and rhizobia inoculation across variable soils in Zimbabwe, by Chekanai, V., Chikowo, R., Vanlauwe, B.
IITA News: Youth Agripreneur insists beans can be preserved naturally without using Sniper.